I have to admit, I was late to The Simpsons party. Growing up, I dismissed the show as nothing more than silly dad jokes and cheap humour. After being introduced to the older seasons—specifically the first 10—by my partner, a self-professed super fan, I discovered that the show does have a lot of heart and a ton of life lessons to learn from. At this point, the series feels like it’s been dragged on for far too long. With 30 seasons and over 650 episodes, the show is definitely starting to lose the emotional touch it once had. However, the earlier episodes are still full of emotional depth. As I’ve made my way through the seasons, a number of episodes have struck me as incredibly thoughtful and heartwarming. So, if you’re a newbie to all things Simpsons or just need a reminder of some of the sweeter sides to the show, I’d recommend giving my favourite four episodes a watch. Without fail, I’m always teary-eyed by the end of this episode. It follows Homer recollecting his success in landing his dream job at Barney’s Bowlarama, which becomes jeopardized when Marge gets pregnant with Maggie. Witnessing Homer’s emotional and financial struggles, the episode really underscores the powerful love that close-knit families have for one another. Life isn’t easy; sometimes you must make difficult decisions because you know they’re the right ones to make. It might not feel worth it at the moment, but one day it will. In the end, love prevails. Especially Homer’s love for Maggie. This episode shows Lisa’s first experience with grief and the hardships that come with it. 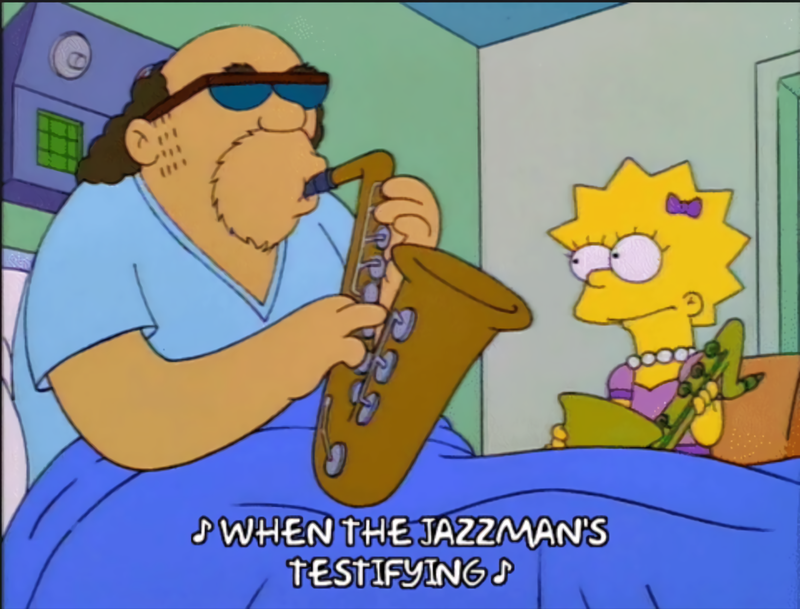 In an earlier episode she became friends with an unlikely (and often judged) jazz musician named Bleeding Gums Murphy. In “’Round Springfield,” Lisa stumbles upon her old friend in the hospital, all alone and dying. 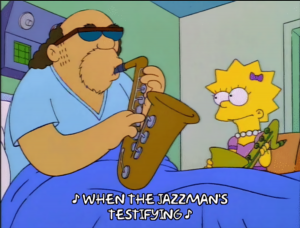 Before he passes, Bleeding Gums Murphy selflessly gifts Lisa his lucky saxophone and gives her the confidence she needs to perform at her school recital. To pay tribute to his memory, with the help of Bart’s generosity, Lisa sets out to make sure that all of Springfield knows Bleeding Gums Murphy’s name and talents. It’s a beautiful coming of age for Lisa and a touching look at how difficult grief can be for kids to process. This episode serves as a touching reminder that despite their constant sibling rivalry, underneath it all Bart and Lisa share an unconditional love for one another. As the episode closes, viewers are treated to Maggie’s first—and only—word. I won’t spoil it for you, but what I will say is that it’s a word that both Bart and Lisa cheekily take a stand against throughout the episode. In “Scenes from the Class Struggle in Springfield,” we see Marge struggling with her looks, her social status, and her financial stability. After buying a heavily discounted Chanel suit from an outlet mall, Marge longs to wear the suit somewhere special. With nowhere to go, she ends up wearing the suit to tidy the house and to go to the Kwik-E-Mart. At the Kwik-E-Mart, Marge reconnects with an old high school acquaintance who introduces her to her wealthy socialite friends. In their presence, Marge feels inadequate and clings to her new Chanel suit to give her the confidence she so desperately desires. Not feeling like she can live up to her new social circle’s standards, Marge goes to extreme lengths to try to impress them. Ignoring the concern of her family, she becomes dead-set on gaining the acceptance of people she doesn’t even care for. In the end, Marge realizes she’s more comfortable being the person she always has been. She finds confidence in self-acceptance, realizing the only approval she needs is from within.